On Tuesday, September 5th the Trump Administration officially announced the ending of the DACA Program. 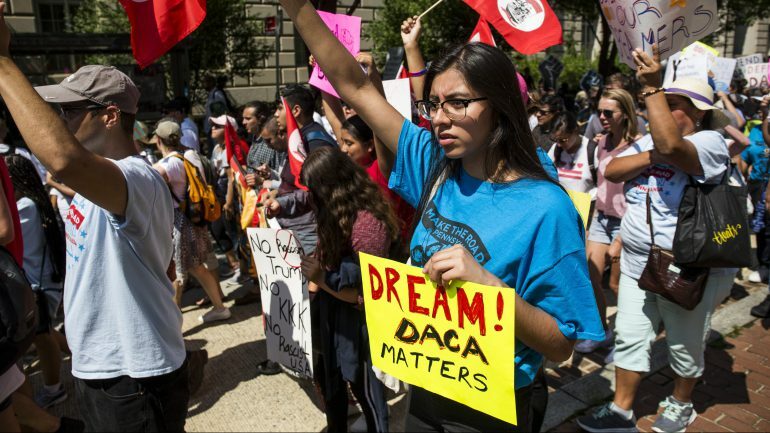 DACA, or Delayed Action for Childhood Arrivals, was a program which grants undocumented immigrants a renewable two year visa for work and schooling. This action led to immediate pushback from Silicon Valley, where skilled laborers are in extremely high demand. Most notable is a statement from Microsoft president and chief legal officer, Brad Smith, saying that Microsoft currently employs 39 DACA Beneficiaries and “if the government seeks to deport any one of them, we will provide and pay for their legal counsel. We will also file an amicus brief and explore whether we can directly intervene in any such case. In short, if Dreamers who are our employees are in court, we will be by their side”. Other tech giants including Facebook, Apple, and Google all issued statements condemning the termination of the DACA program. These public outcries however, mark only one point in Silicon Valley’s long battle for cheaper and more accessible skilled labor. Silicon Valley giants have long been leaders of the fight for immigration reform, with leaders sinking millions into lobbying for more and easier applications for H-1B visas. Many tech leaders, notably Mark Zuckerberg and Bill Gates helped found fwd.us, an organization advocating for more open borders and immigration reform. Silicon Valley leaders from both sides of the aisle and the Trump Administration have consistently disagreed on immigration policy since Trump’s first day in office, but now it looks as though Trump may be giving in, at least on the front of DACA: after seeing the response of both the public and business leaders to the DACA repeal, Trump gave congress 6 months to pass a new Program to replace DACA, tweeting “Congress now has 6 months to legalize DACA (something the Obama Administration was unable to do). If they can’t, I will revisit this issue!”. It looks as though the discontinuation of DACA will not have a large affect on Silicon Valley due to the relatively small number of workers it affects and the shift of view by the Trump administration. However, it is evident that the rift between the Trump administration and Silicon Valley’s stance on immigration will continue to grow in the coming years. To what extent do you think this rift between the executive branch and Silicon Valley will affect things in Washington?